It took me long time to start to write about tea ceremony teacher even I promise it on my essay about "the tea ceremony"
First of all apologize it and also please be kind to have a look at the essay to understand this blog well. Ms Sokei Maeda was born in Shibuya Dogenzaka where is close to Shibuya station as medical doctor's only children in Taisho era (before WW2). At this time, still class society and not equal idea. If you were born at doctor house, can imagine how her family was rich. She said never even sharp own pencil since she was surrounded by many maids and they did everything for her. If she wished, she could go to higher education but she didn’t, neither her parents did not want to her to become a doctor but a Shuji penmanship teacher since they found her talent of it. So her last education is high school but you may know my mother is much younger than her but my mother even could not go a middle school but all her brother went to even high school. Japanese society believed the education is only for men at that time. So we can say Ms Sokei get very high education as women at the time. It is rich people’s duty or joy to support future important parson, seems Japanese old people felt so. Her house was full with Shosei and seems some of them were interested in Sokei-sensei since I saw one drawing at her house. She said one Shosei made it. The title was ”ojyosan” hard to explain it but Ojyosan sounds like “upper class single lady” from lower class parson. You can still feel classy society. Have you ever read it?“Tuesdays with Morri” which gave me strong memory. American real story… One professor who suffered ALS met one old student on Tuesdays till his die and communicate what is life. I learned many thing from Ms Sokei through her tea ceremony education so gave the title. I have started as Sunday student at Ms Sokei tea ceremony lesson at her house. 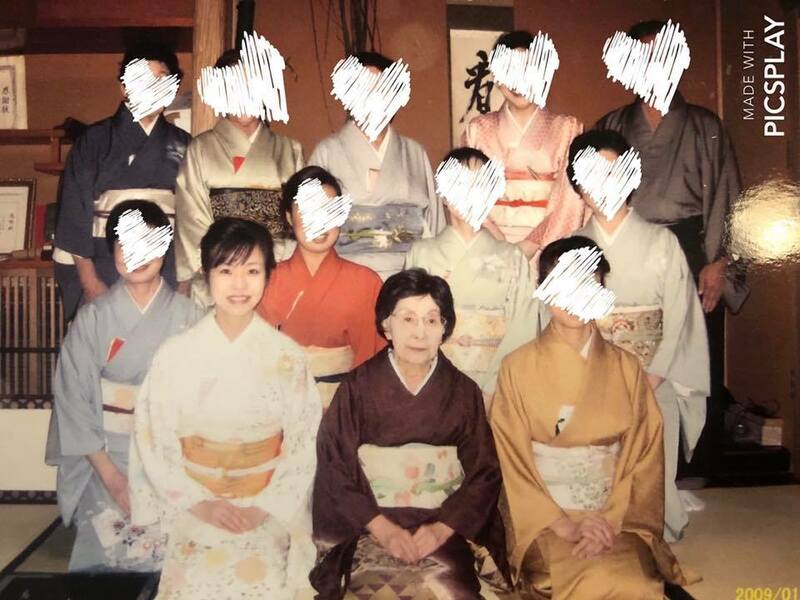 She thought tea ceremony at many places, city centers, pubic school etc… Going to teacher’s house class is more special we are called “Uchi-deshi” means is more inside student. She has two class at her home tea ceremony room on Sunday and on Thursday. On Sunday, it is for more young ladies and indeed all singles who has a job. Class started at 1pm and kind of more for chatting as you can imagine. I have a good friend there and love to talk with her and others. However one day Ms Sokei asked me to come on Thursday. At that time, I have been working for my mother’s Kimono shop and I could get day off on Thursday too. However, I know Thursday’s class is stricter and almost all student even have certification of very upper class. If you study tea ceremony for long (around over 10 years), you would get the tea ceremony name from tea ceremony official school and all of them hold it. I was so worried. Why I needed to go there? I was the newest student and could not do anything. I might be disturbed Thursday students. All were housewife and retirement men. Have plenty time but I was not… However I have started feel that chatting at tea ceremony class was not good. And furthermore, I have started to feel Ms Sokei’s Love. Not only strict but feel something “she wants me to learn real tea ceremony”. So I had accepted to change the class day. Even it started from 9am and end at 3pm (sometime more) on Thursday as well as must make a Bento box on every Thursday.